Synopsis : It all starts with the flip of a coin. 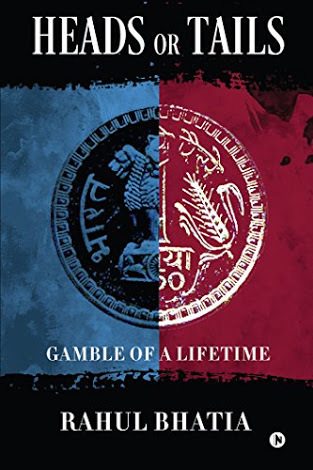 Shrey is a daring risk-taker, who gambles with his life. Struggling with his indecisiveness, he takes dangerous decisions based on the game of Heads or Tails, believing he has tapped into a lucky streak that will never run out. Shrey falls in love with the adventurous, playful Tamanna, wins a jackpot for his gambler friend Sahil, as he discovers the secret to living a perfect life. However, after a wrong turn, his fate changes and madness begins. Everything starts falling apart like a house of cards. Will he still choose his destiny above all? Join Shrey on a thrilling journey into the darkness and divinity of the human soul. My view : The debut novel of Rahul Bhatia makes for an interesting read. Heads or Tails is about a young man, Shrey, who has a disturbing past to account to. His past had shaped him into a brooding, stubborn and indecisive person. His inability to reach to conclusions regarding any matter pushes him towards taking help of a coin flip to decide; an extremely harmless habit that gradually comes him to suffocation. Sahil, his best friend, who is a complete contrast to Shrey, extends his constant support and care and brings a little more energy and spirit into his life. The tiny snippets of the college life described by the author is fun to read and reminded me of my friends from the Uni. Shrey has a huge crush on his batch mate, Tamanna. Her daring and mischievous demeanour attracts him and she starts nurturing feelings for him. It might seem to be a regular love story, but there is a twist in the tale. Shrey’s dependency on the coin at every step irks Tamanna. She is worried about this habit of his and continuously expresses her disapproval. A sudden unfortunate accident in their lives renders Shrey incapable of letting go of the coin. He disappeared into his cocoon of safety and refuses to behave like a normal person. His studies are greatly effected and his ambition is shattered. On the other hand, Sahil is also trying to cope with the disastrous effect of the accident that he witnessed. Sharp words, ceaseless fights and insecurity forces Shrey to take the most massive decision of his life and he takes the help of the coin. I am not going to spoil the ending for you by disclosing any more. What I liked about the book was the light humour and banters among the group of friends. It was extremely real and one can easily connect to that. Shrey as a character is likeable and the depth of his conversation with Tamanna is striking. Their relationship is sincere and so is Shrey’s friendship with Sahil. Somewhere down the line I could connect with Shrey’s personality. His aversion to meaningless lectures, his desire to keep his mind busy all the time, his resolution to work hard and achieve. The concept of the coin flip was absorbing although not entirely unique. The characterisation could have been a little more researched. The characters of the book fell into stereotypes which was a shame. The discussion between Sahil and Tamanna in the later part of the book appeared to be a little preachy and that disappointed me a little. Although the end was well narrated yet it hinted on a shade of predictability. Nevertheless, I am impressed by happy endings and the book did not fail to make me happy. Overall, Heads or Tails makes footer a satisfactory read. As the author’s first novel, I would term this to be a successful entry into the literary world.